Where could Carolynn, a 6 year old, have gotten the idea that she wanted a gallery you ask? That’s not even all of them…When I started writing this, I counted SIX different areas in the house where we have hung pictures, signs, quotes, and treasures in the gallery style. Too much? Meh. Oh well. There were a few character building (for both of us) discussions about listening to other’s ideas, and it’s ok to disagree with someone…..and not interrupting even if you think you don’t like the other person’s idea. Two first born children putting up a gallery wall here. The struggle. She had a few things already hanging, so “we” (read above paragraph) decided to work on that wall to incorporate what was already on display. There were those conversations, building our characters, but we also had a sweet time together making a plan and getting it all put up. The way I figure out a gallery, is by first laying everything out on the floor. I move this here, that there until it looks right to me. I try to stick to groupings of odd numbers. I also like to balance out one big picture with two smaller ones under/above/next to. Or an item (a wreath, a sign etc) with something less dimensional, like a photo or sign. There’s the kittens! C has done that needlepoint herself. She’s almost finished. It still needs some work, but as you can see, she’s pretty pleased with it and there’s room to add on more treasures. I better get to my “addicted to gallery wall” group meeting! Thanks for reading!! Hey hey everybody! It’s FRIDAY! I am so excited to share a really fun makeover we gave this very awkward space in Carolynn’s bathroom. We spent about 2 hours, and only used things we already had around the house! C and I had lots of fun with this, and spent nothing, except time. Which was special and sweet and a memory to treasure. Isn’t that a funny space? It’s right across from Carolynn’s sink in her strangely large bathroom. 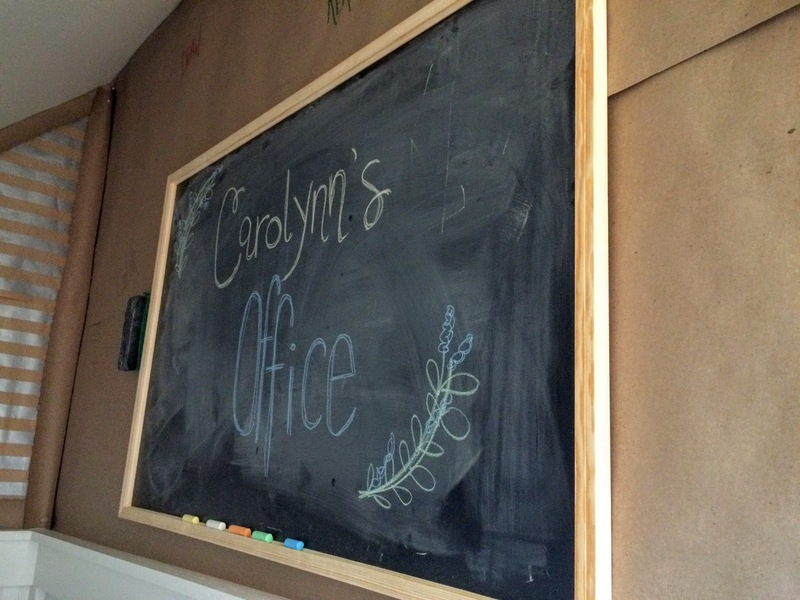 While planning this makeover, one of Carolynn’s expectations for her office was that it had a Welcome mat. She made that “mat” herself from a roll of brown paper. She really took her time adding each detail. We used this wrapping paper as wallpaper. 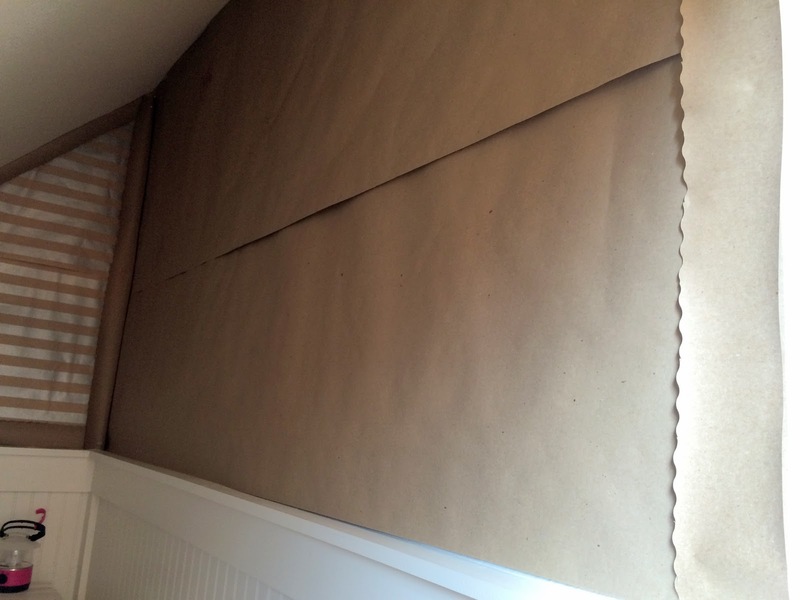 A roll of this brown paper cost less than $5 at Wal-Mart. I used it to roll out on our floors on muddy days, and as a table runner that we could write on. It’s pretty durable and I have a ton of it left. Here’s a mega roll, available on Amazon. On the wall, Carolynn can draw and color on it. We had this chalkboard in the playroom, but it didn’t really have a place and just was moved around for the kids to play with. Now, it has a home, but can still be taken off the wall if they want to play with it somewhere else. It serves as another medium for Carolynn to write, draw or color. 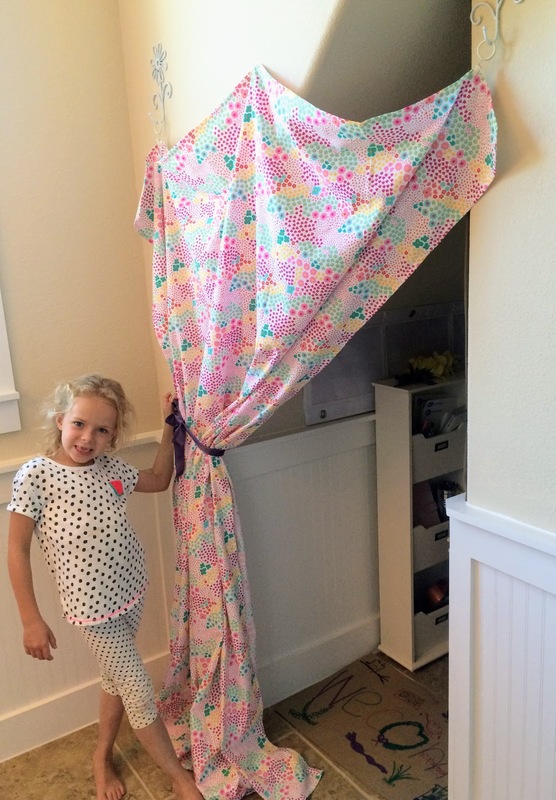 Making a “door” was tricky since the doorway is awkward, and let’s face it, the whole space is awkward. 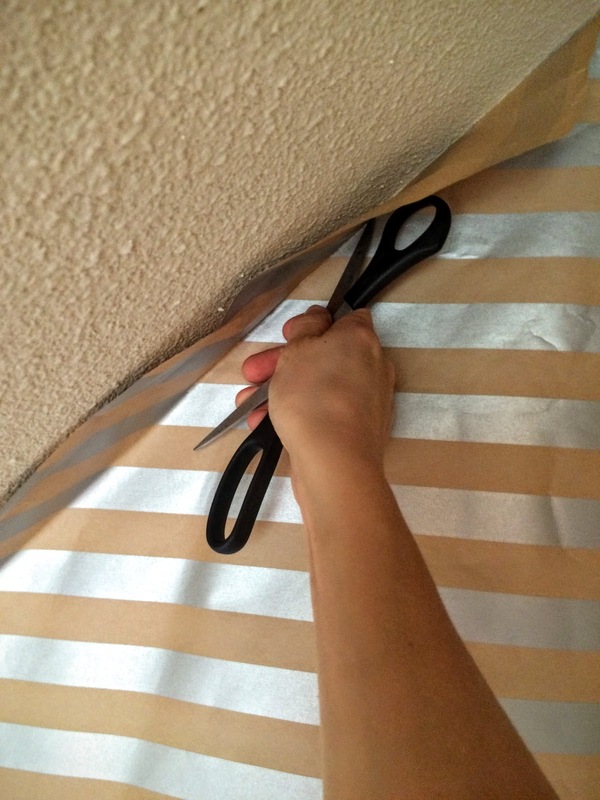 I used two daisy hooks and hung this Spring tablecloth ( Get it at Target ) with drapery clips. Also, this super cool, self-adhesive wall paper from Amazon. I am loving all the floral prints, and the aqua and pink in this one is so sweet. 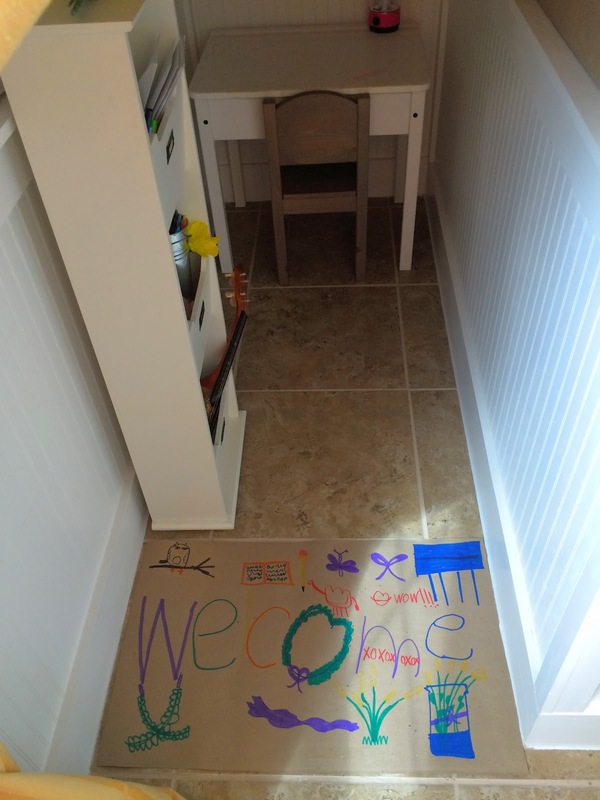 Although C had to have a Welcome Mat, my ideal little nook would have a runner, or small rug inside. Like this gingham cutie from Target. Because GINGHAM. I am really happy with how it turned out, but it’s fun to shop. Sometimes I go shopping online, with no intention of purchasing just to get ideas and be inspired. Pinterest is great for that too. (are you following me on Pinterest?) You can see someone else’s great idea, and realize you have just what you need, or a version of it to create the same look. Being economical is so creative. And so economical. So, duh. Carolynn is so proud of this little space, and so am I. We had so much fun creating this together. 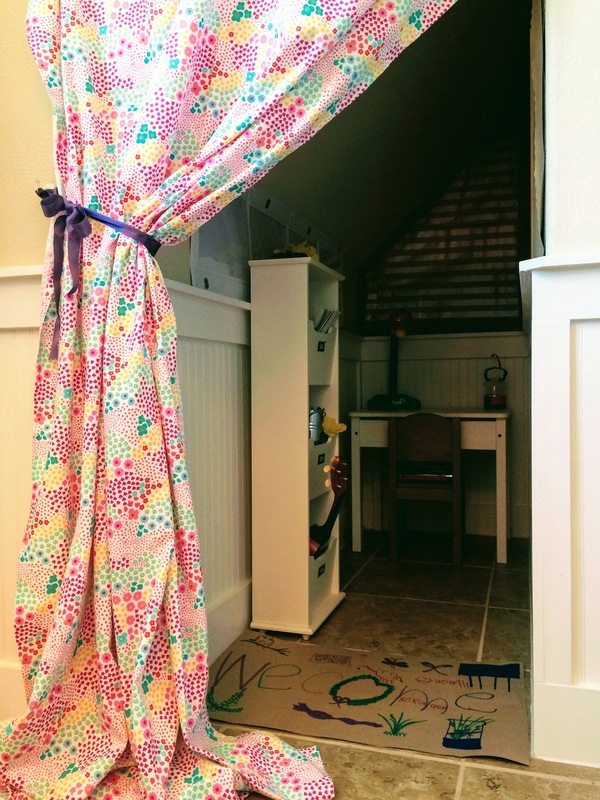 Thank you so much for reading about it’s transformation from, “what are you going to do with that?” into Carolynn’s cozy, little office.